Each year, 14% of the American population move at least once. The current trends show Americans moving to warmer climates, more affordable areas, and areas with better job opportunities. The Wall Street Journal recently ranked the Top 50 US Cities Americans are flocking to. In order to find the top 50 cities American are flocking to, the Wall Street Journal reviewed population growth figures from the U.S. Census Bureau’s Population Estimates Program between the years 2010 and 2017. Knoxville ranked #47 on the list of 50 cities. Between the years 2010 to 2017, Knoxville’s population has increased by 36,696 due to migration. That’s a population increase of 4.7%. 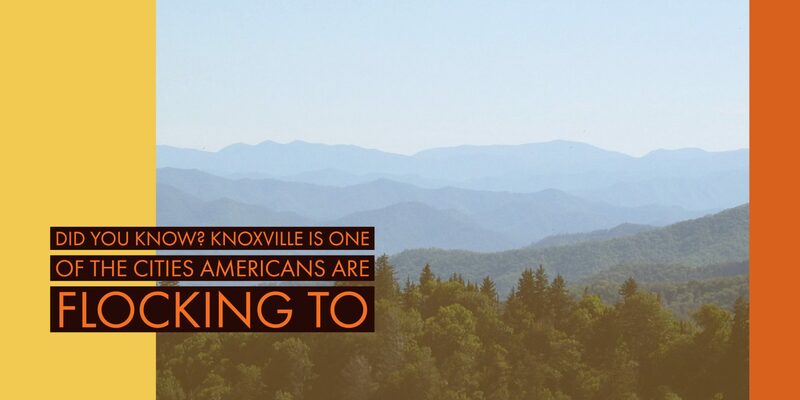 It’s no shock that Knoxville is among the cities that Americans are flocking to. Knoxville has a mild climate, but still experiences that change of four seasons. Luckily, though, winters in Knoxville are mild. Knoxville also enjoys a low cost of living. With no state income tax, and affordable living conditions, Knoxville is a place where your paycheck goes a long way. Knoxville is also home to major employers, like the University of Tennessee, Y12 National Security Complex, Oak Ridge National Lab, and Scripps, among many others.